Our name could explain it all — MindStretch Travel Adventures. So of course, travel is in itself a mind-broadening experience. We get to see new things and explore the old. And while we would never say we were “educational,” boys naturally learn new things about the world and themselves during an experience like ours. It doesn’t matter whether our trip is three hours from home, half way across the United States, or across the Atlantic Ocean…just being somewhere new is an amazing experience. And once we reach our destination, that is often just the beginning of our journey as we continue to reach out and visit other places from each new “home” base. It’s all an adventure! So some of the main differences. Each trip is a new home base. We’re a travel experience after all. Each year we usually offer two main adventures, one is usually close to home and the other farther away. 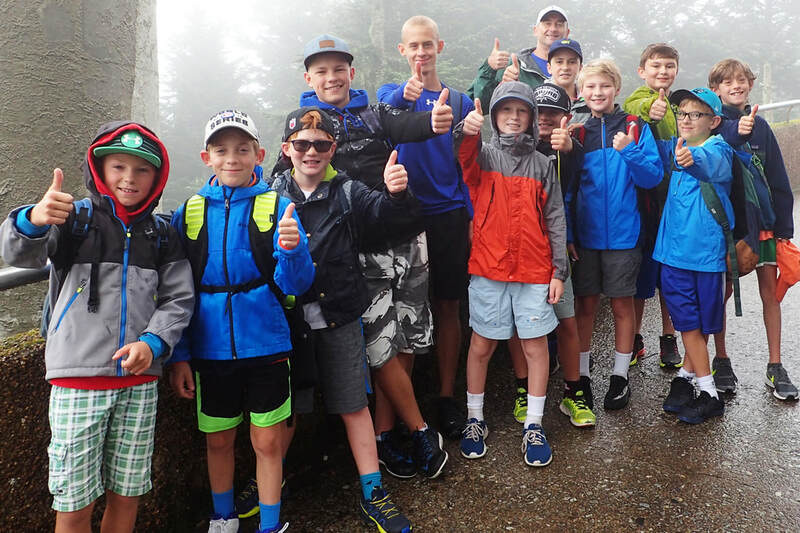 So right from the start, we offer boys a new destination each year and with each trip from which to explore and participate in a variety of activities based on what the area might have to offer. Boys returning for several years are always going to new places. It never gets old. Trips are often repeated after a few years and occasionally a boy will want to go back for a second round. Even then the trip is never the same. We’re always changing around activities based on new things we’ve discovered. ​At a residential camp, a boy pretty much stays put. He might get to travel to the next county over for a hike or canoe trip…but most of the activities are held right on the camp’s property. And while there’s nothing wrong with that, after all, we ran our residential camp for many years…it’s nice to have a chance to see new country. 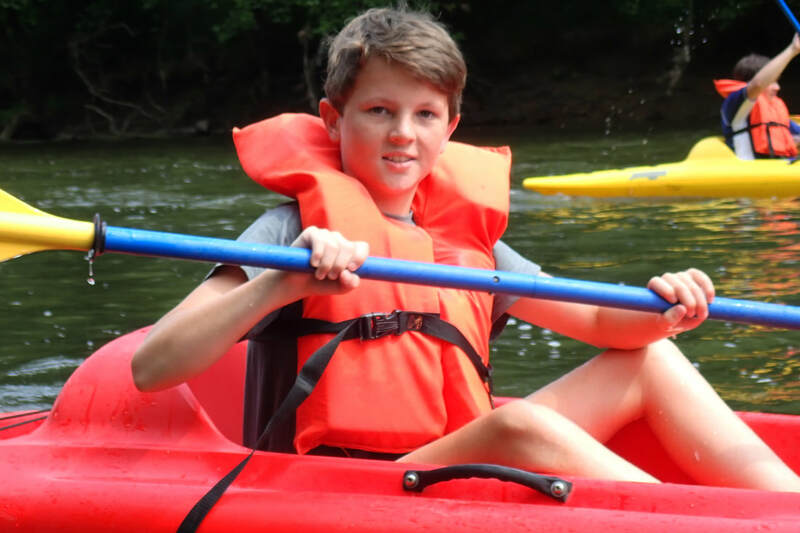 Kayaking in Virginia in 2018. We'll be sea kayaking in Maine in 2019. Leaders on the Virginia Highlands trip doing a sound-check for the drive-in movie. Okay, some people might say “old,” but we’re all young at heart. While most camps have some mature folks hanging around, the ones taking care of your son on a day-to-day basis are probably 19-21 years old. And while there are plenty of mature 19-21 year olds in the world, they don’t always have the best judgement. Our staff is made up of teachers, former teachers, parents, and even grandparents. All are known to us and have plenty of life experiences to share. They also have the maturity to know when to say “no” when a boy wants to run with the bulls or some crazy activity like that. Our home away from home is a bit more like home. We stay in hotels, lodges, and occasionally a hostel (Europe only) and boys enjoy living with a small group of guys with their own bathroom, air conditioning, and even a TV. (Okay, we don’t encourage or allow electronics, but the TV in the room stays!) But just like a regular camp, the boys' rooms do get inspected most mornings before we leave for activities and there is a set bedtime. ​Mealtime is another big difference. Instead of gathering at the mess hall with 250 or more other people, we head out to a local restaurant for a sit-down meal where the boys usually get to choose from the menu. And as good as most camp food has gotten over the years, it’s a pleasure knowing you’ll always find something you want for dinner. Most of our breakfasts are provided by the hotels and lunches vary between a trail lunch we pack for ourselves or a fast-food kind of lunch somewhere if we’re around town at lunch time. 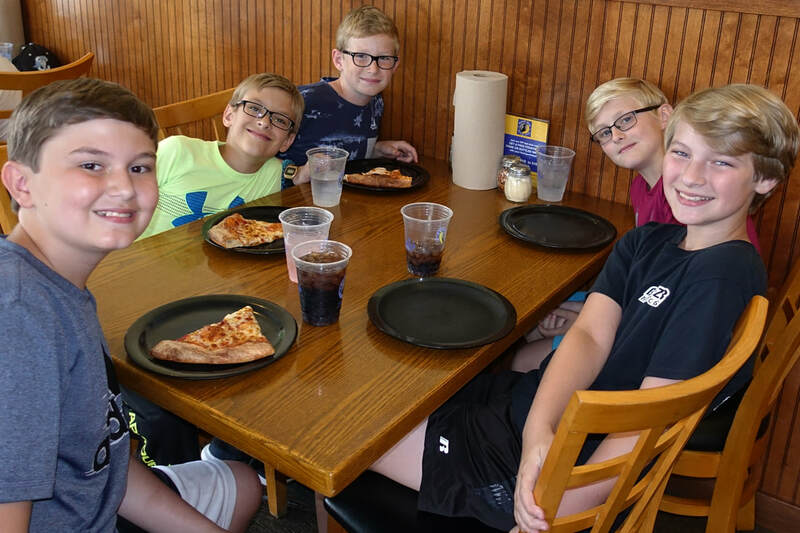 Pizza is always a favorite, but even o pizza night boy can choose from the regular menu. A small program makes a difference to the individual boy. Most boys will do just fine in a regular camp, but occasionally a boy gets “lost in the crowd.” While he might have a counselor to look after him and try to get him involved in camp activities, there are some boys who find ways to do nothing in a residential camp. They move around from activity to activity but are seldom in any one place for more than a few minutes. During our programs, we generally do everything as a group or as two smaller groups. We’re busy from morning to evening, though we do find times to chill — like swim time after a day out adventuring. ​And with a small program, everyone definitely gets to know everyone. At a large camp, boys are rarely known by the camp director other than by name. We are all together all day long. If you give us a call, we can tell you what your son has been up to that day. Let’s face it. Some camps are run just like schools. Boys sign up for classes (they might call them activities) and a schedule is developed. The camp rings a bell and boys move to the next activity. Eventually they have lunch and rest hour and then it starts again. Tomorrow the same thing. The next day, repeat. Our program varies each and every day. Other than eating and sleeping, no two days are the same. We have one or two major activities a day and then other smaller things to round things out. Boys on a MTA trip are always asking, “What are we doing tomorrow?” At a regular camp they pretty much know the answer. ​The downside of this is, to be honest, a boy on a MTA trip will not become accomplished at a particular activity if that’s his passion. He might get to bike once, raft once, hike a couple of times. But each day is filled with these kinds of activities. MTA boys don’t complain about boredom because each day is truly an adventure to anticipate. We’re the perfect camp for first-time campers, timid campers, or boys just wanting a change from the ordinary. There are some boys whose parents will say, “just aren’t campers.” They don’t want to leave home. That brings us back to the quote at the top of this page. It’s good for kids to learn some independence with the guidance of mature staff along the way. But some boys just don’t want to share a cabin with 8 or 9 others, don’t like the routine of being put into activities he doesn’t want or maybe isn’t ready for, isn’t sure he’ll like the food, or just doesn’t care to be in a large camp situation. These boys, for the most part, do well with our program. But just like any camp, they do need to come in wanting to try new things and explore new places. We’ll take care of that part as long as they’re ready and willing to make the most of their adventure. Then again, there are boys on each of our sessions who will do a trip with us and also spend a few weeks at a regular camp. They want the best of both worlds and who can blame them? We hope you’ll consider a MTA experience for your son. To read more about how a day unfolds, click this link. *That quote at the beginning of this page, often attributed to Mark Twain, apparently comes from the words of writer H. Jackson Brown, Jr.’s mother that Brown used in a book. I hate to spread fake news or fake quotes, so I’m just saying I like it and it sets the tone for this webpage.